These are the steps you will need to follow to apply for and be accepted into the CSRIPS EMT training program. The following estimated fees are paid directly to the vendor (not CSRIPS) prior to class beginning. Prices should be verified with the vendor. American Data Bank (Broward Hospital): $168.00. Includes Broward Hospital, Drug Screening and Level 2 Background Check (scheduling fee may apply). Upon successful completion of the program, the following estimated fees are paid directly to the vendor (not CSRIPS) to take the state exam and become licensed. Deciding to enroll at the Coral Springs Regional Institute of Public Safety to pursue your dream of becoming a Firefighter/EMT/Paramedic in the State of Florida is a huge step. It can be an overwhelming journey if not planned out properly. To help you succeed we will provide information on a career path that may work best for you. We offer all the required courses that you will need in order to become a successful candidate for a position as a Firefighter in Florida. Most agencies located in the South East (Broward, Dade & Palm Beach) will require candidates to be Firefighter/Paramedic certified as a minimum however other regions will hire Firefighter/EMT’s or just Firefighters. This means that you will need to complete EMT, Paramedic and Firefighter I & II and become State certified in all three courses. This can be accomplished at CSRIPS. Now you need to decide whether to start with the medical courses, EMT and then Paramedic, or the Fire course, Firefighter I & II. The information we provide can help you determine which will be best for you. Please review each course to assist with making the best decision for you to be successful, remember this process can take up to two (2) years to complete. Good Luck! Acceptance into the CSRIPS EMT program is a first come first serve process. Only students that have a fully completed application, including application fee, will proceed in the application process. If your application is not complete in any way, your application will not be reviewed and will not be accepted. If you are a returning student, please read this carefully. When you apply, please enter your name and email that is currently on record. Once you do that, you will be presented a screen that will direct you to your email for a personalized link to complete your application. Do NOT share this link with anyone. This is your personal information. When you click on the provided link, your application will appear and the information in your student record will be automatically populated. Do NOT create a new student record if you are a current student with us. Duplicate records may cause you to be removed from the program. The student has the option of attending the Open House. Due to limited seats, the student may bring 1 family member. It is strongly encouraged as this provides the prospect and family member an opportunity to better understand the commitments that will be required. The Open House is structured, starts promptly at the documented time and lasts approximately 2 hours. Open House registration fills quickly! Students must complete the CSRIPS BLS Healthcare Provider course at least 2 weeks prior to the start of the EMT-Basic class. Cards from other organizations will not be accepted. 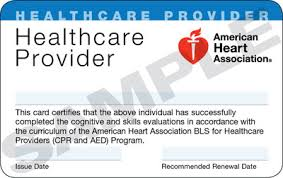 Your BLS Healthcare Provider card must be active for the duration of the course. In order for your application to be submitted for review, you must complete all of the required information and upload during the application enrollment period. This is a first come first serve process so in order to increase your chances of being accepted, you are strongly encouraged to have all information ready when you begin your application. Below is everything you will need to have on hand for the application. You will need to have a PDF or picture for certain file uploads. *Medical information is collected from Broward Health during the Complio registration. In order for your application to be submitted for review, you must complete all of the required information, including uploads, and make your application payment during the enrollment period. This is a first come first serve process so in order to increase your chances of being accepted, you are strongly encouraged to have all information ready when you begin your application. Incomplete applications will NOT be reviewed and the prospective student will not be considered part of a roster. Upon completing the application, the student will receive an email from CSRIPS notifying them their application has been received along with any potential issues. This does not indicate the student has been accepted. The student should not expect to hear a final decision until the Notification period as outlined for the term. Please do not call the office inquiring about a submitted application. All applications are submitted electronically and the admissions staff is reviewing and notifying students accordingly. Each term has a notification period. Please do not call the office asking about your application status. You will be notified about your status during the notification period via email. Email is the primary means of communication. It is the students responsibility to check email daily. We will not track you down. If the assignments or tasks listed below do not get completed by the assigned date, you risk being dismissed from the class. Should a student be accepted into EMT, an email notification will be sent welcoming the student and providing instructions for the next steps. The student will be provided information for books, drug screening, Day 1 expectations, dress code, rides and clinicals and Complio registration information. Some of these items will have due dates. It is extremely important the student review the information and plan their time accordingly. Any item not getting done by the due date will result in the student risk being dismissed from class. For the Immunization Information, CSRIPS has provided a form for you to use if you choose to. Please review the Broward Health Requirements to ensure you have everything ready when you enroll in Complio. Have you read all 6 steps above? Did you complete or at a minimum register for an upcoming BLS Healthcare Provider class? Do you have all of your files saved in the proper format and ready to upload? Do you understand how you will be notified of your status? Do you understand you will be responsible for items after you submit your application and if you are accepted? Students registered for EMT-Paramedic at the main Coral Springs campus will be only be permitted to complete clinicals and rides that correspond with that campus location. Students will not be permitted to ride or complete clinicals at Martin County or St Lucie County locations unless they are riding with their own department (must meet requirements). Students registered for EMT-Paramedic @ Martin County will be only be permitted to complete clinicals and rides that correspond with that campus location. Students will not be permitted to ride or complete clinicals at a Broward County or Miami Dade location unless they are riding with their own department (must meet requirements). Students must have a BLS Healthcare Provider card issued by the City of Coral Springs Training Center. Please see above for more details. CSRIPS @ MARTIN COUNTY REGISTRATION ONLY!